The past year has brought a mixed bag in terms of sustainability wins and losses in the sports world. In our 2014 Best and Worst post, we characterized last year as one in which green sports gained maturity, based on the notion that sustainability in sports is now the rule rather than the exception. The phrase that comes to mind to describe green sports in 2015 is increased influence — on display most recently at the Sustainable Innovation in Sport symposium as part of the COP21 climate conference in Paris. GreenSportsBlog worked to share examples of that increased influence throughout the year and is pleased to offer our readers an influential Best and Worst list for 2015. That college and university athletics departments in the U.S. are greening at a rapid pace should be well known to GreenSportsBlog readers. We highlighted the great green sports work being done at schools large (Ohio State and Ole Miss) and small (Amherst and its embryonic, student-athlete inspired greening program) during 2015. But those are individual schools. As the recent COP21 climate conference in Paris clearly demonstrated, the world needs countries and businesses, including the sports business, to scale up their greening efforts — and quickly. In the college sports world, "scaling up" means that greening needs to step up beyond the individual school to the league/conference level. So up stepped the Pac-12, GreenSportsBlog’s 2015 Greenest Sports League. In 2015, the Pac-12, one of the most influential college conferences on the field, became the first collegiate sports conference to join the Green Sports Alliance (GSA). This was a natural progression as all 12 schools (Arizona, Arizona State, Cal-Berkeley, Colorado, Oregon, Oregon State, Stanford, UCLA, USC, Utah, Washington and Washington State) were already individual members. From zero-waste stadiums to solar powered arenas, Pac-12 schools are walking the college-sports-greening-movement walk. All 12, with the organizational support of the GSA, recently competed in the inaugural Pac-12 Zero Waste Bowl, a competition to see which campus could divert the most waste from the landfill at a selected home game during the 2015 football season. Colorado took first place honors, with Cal-Berkeley and Arizona finishing second and third, respectively. Dave Newport, director of the University of Colorado’s Environmental Center and a key player in the greening of Colorado and Pac-12 athletics, said that Zero Waste is just the beginning: "A number of Pac-12 schools are cooperating on a novel water program that will actually increase water flows in the Colorado River Basin — obviously a critical resource for many Pac-12 campuses. Next year, we may add that to our competitive sustainability games because everybody wins when water is restored." One might expect that this award would go to a huge green stadium, a la 2014 winner Levi’s Stadium in Santa Clara, California, home of the NFL’s 49ers and host of Super Bowl 50 in six weeks. Transformed what once was a contaminated brownfield site into a state-of-the-art, über-green ballpark. Built the first major sports venue to reuse rainwater for field irrigation. Reused nearly all of a former Gillette warehouse building to construct CHS Field. Use District Energy St. Paul’s water-steam based system for heating and cooling loads, which are about 35 percent more efficient than traditional grid supply. Working with Xcel Energy, gave solar a big role at CHS Field, with a 100kW solar system which supplies 12.5 percent of the ballpark’s power. CHS Field, home of the St. Paul Saints minor league baseball team, is perhaps the greenest stadium in the U.S.
We expect that the Saints’ approach can and will influence bigger stadium projects going forward and are thus proud to name CHS Field the Greenest New Stadium of 2015. The Pats are very, very good on the field. Defending Super Bowl champs and, despite a ton of key injuries, sitting at 12-3. They have, for seemingly the 3,004,387th year in a row, clinched the AFC East. The play of 38-year-old Tom Brady shows no signs of slipping. And the Pats are very good off the field, at least from a green perspective. Back in January, before the last Super Bowl, GreenSportsBlog compared the green records of the two combatants, New England and Seattle. Seattle won (better on mass transit usage and waste diversion) but it was close as the Foxboro, Massachusetts-based Patriots were given high marks on energy (strong energy management at Gillette Stadium, on-site solar, 100 percent use of clean energy to generate all electricity on game days via the purchase of Renewable Energy Credits) and water (100 percent recycled "grey water" supplied by the stadium’s own state-of-the-art on-site wastewater treatment and reuse system). Here’s some great green sports news. As far as GreenSportsBlog could tell, all of the new stadium and arena projects that opened in 2015 or are being built for 2016 and beyond have some sort of green hue, with many seeking LEED certification. OK, there is one exception: SunTrust Park, the new Atlanta Braves stadium being built in the suburbs, inaccessible by light rail. Thing is, SunTrust "won" this award last year and so we didn’t need to go there again. We are happy to retire this award after just one year. Back in March, it was announced that 10 influential college athletics programs — Iowa; Iowa State; Kansas State; Minnesota; Oklahoma; Oklahoma State; SMU; Texas A&M; Texas Tech and Wisconsin — had entered into a marketing partnership with Koch (pronounced "Coke") Industries. How does this warrant the Sports Greenwash of the Year designation? First, let’s define greenwash as when an entity promotes environmental initiatives, but actually operates in a way that is damaging to the environment or in an opposite manner to the goal of the announced initiatives. With that in mind, you have athletics and sustainability departments at schools such as Minnesota and Wisconsin promoting their greening efforts — which are legit, by the way — among students, fans and other stakeholders. On the other hand, these same schools take sponsorship dollars from Koch, which, among other things, has funded groups denying climate change to the tune of $67 million since 1997, is the third largest holder of Canadian tar sands oil leases, among the dirtiest oils on the planet, and, through its Americans For Prosperity political action group, is leading a fight against the expansion of the solar power industry in Florida. So, Minnesota and Wisconsin (we highlight them because, of the Koch 10, they are the schools that are promoting the greenness of their athletics departments the most), sadly, you’ve earned your Greenwash of the Year for 2015. 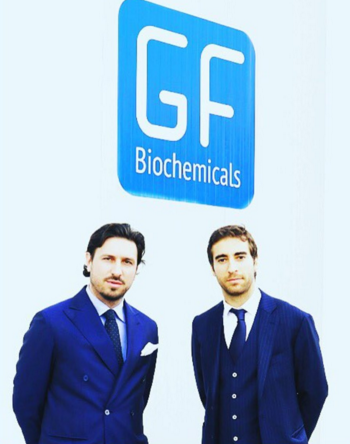 Scale and influence: Flamini co-founded GF Biochemicals, an alternative energy company which produces levulinic acid (LA), a clean solvent sourced from biomass that can replace all manner of petroleum-based products, including fuel. It is the only company to produce LA at commercial scale. Flamini’s/GF’s goals are simple yet bold: Help wean the world off of fossil fuels, employ people in economically challenged Italy and, in the process, capitalize on a what is projected to be a $20 billion emerging market. Eco-athlete: Not many world class athletes have gotten involved with environmental/climate change-related issues. But there are some — in fact, GSB featured four amazing eco-athletes, including Flamini. Flamini, 31, plays for Arsenal (North London), which leads the Barclays Premier League, arguably the best and most influential soccer league in the world. Hopefully, by the end of 2016, there will be enough Flaminis that we can institute an Eco-Athlete of the Year Award. Human Interest: Flamini came up with the idea for the company with a friend while he was playing for AC Milan in 2008. Just think about that for a minute. How he did this while pursuing his time-consuming career at the highest level of world soccer is beyond me. The German-based apparel and athletic shoe manufacturer drew strong consideration for its work with non-profit Parley for the Oceans to help get plastic waste out of the oceans. That partnership yielded a first: An adidas shoe upper made entirely of yarns and filaments reclaimed and recycled from ocean waste and illegal deep-sea gill nets.